What’s the Difference Between Hot Sauce and Wing SauceHow To Cut Chicken WingsBBQ Chicken WingsGive a High Five to Chicken Wings! Toss out that deep fryer, just like last year’s jeans. We’ve got the solution to crispy chicken wings without the hassle of deep frying. These ones are baked but use a secret technique to make them extra crisp. Raise your hand if you like chicken wings. Good. Now keep them up if you enjoy spending time in front of a deep-fryer while oil splatters all over the kitchen. Did I see a few hands go down? Mine sure did. It’s been branded into our heads that chicken wings need to be deep fried to be crispy. However, after some research (and yummy taste-tests), we are proud to share our findings on how to bake chicken wings that are sooo crispy. Here’s a video showing how we make our crispy baked wings. Then we’ll give you more info about the process below. Were you surprised by the baking powder in that video. Unusual right? Stick with me as I go into the details. Baking powder, not to be mistaken with baking soda, is a leavening agent usually used in baked goods such as cookies and cakes. It’s a mixture of sodium bicarbonate, cream of tartar and cornstarch. When mixed with salt and coated on chicken it dries out the skin, leaving it crisp and crunchy. Why does this happen? Get ready, sciency stuff ahead! 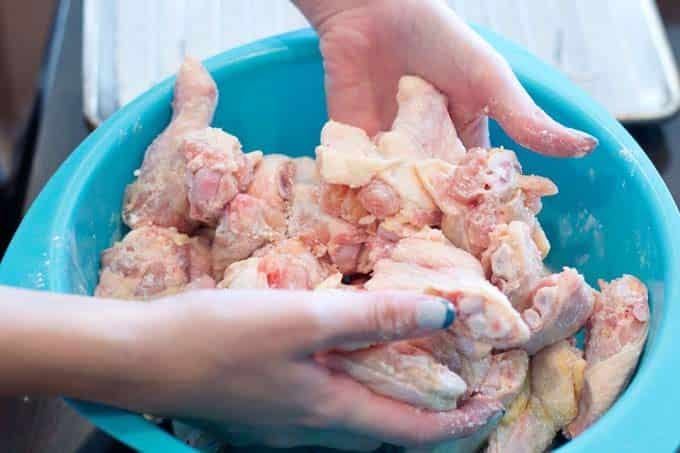 It happens because the addition of the baking powder raises the pH level in the chicken, allowing the peptide bonds in the skin to break down, thus letting the skin get more crisp and brown. Note that while most of the comments below this post are very positive (people seriously love this method of baking crispy wings) a couple of commenters noted a bitter taste on their wings. I at first thought that they were using baking soda instead of baking powder. Doing so would definitely lead to a terrible taste. However, they claimed that they were really using baking powder for sure. I was stymied until another helpful commenter posted this link showing that some people are sensitive to a flavor that is found in some brands of baking powder. Baking powder that contains “sodium aluminum sulfate” has a bitter taste to some people. If you notice this flavor, you’ll want to try a different brand of baking powder. The Rumford brand is aluminum-free, so do try that one. I haven’t yet done a taste test comparison using the two different types of baking powder but I will soon and then I will report back with my results here. O.K., enough chatter. Let’s get cooking! Cut up 10 whole chicken wings. (When you cut ten wings, you end up with 30 wing pieces. That’s 10 drumettes, 10 flaps and 10 wing tips. You’ll either discard the wing tips or save them for another use. That leaves 20 wing pieces that you’re using here. Once they’re all cut up, put them into a big bowl. Sprinkle with 1/2 teaspoon of salt and 1 tablespoon of aluminum-free baking powder (and NOT baking soda!). It doesn’t seem like much but you’re not trying to make a coating for the wings here. You’re trying to change their ph level so that they will crisp up better. Mix it up. Don’t be afraid to use your hands. It’s way easier and one less thing to wash. It’s gobs of fun too! (Hey look! My nails match the bowl! This was unplanned but I like it). 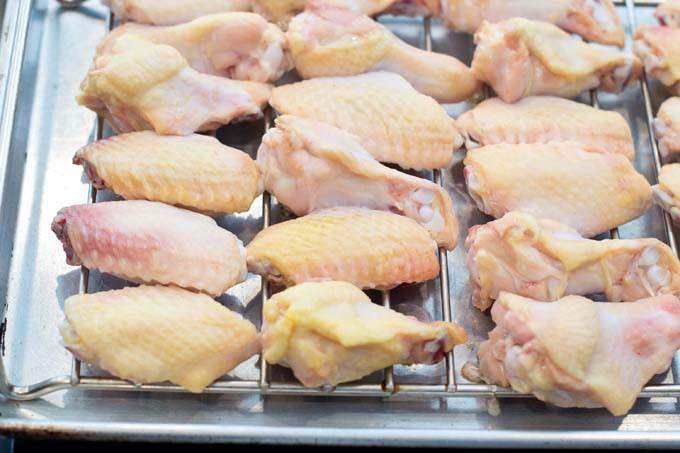 Place the wings on a cooking rack in a sheet pan. This lets air circulate all around the chicken pieces so that they get evenly crisp. It also lets the fat drip away from the chicken, leading to crispy, crispy, crispy skin. Place the chicken in a 250°F oven for 30 minutes. This gets some of the fat rendered from under the skin and starts that drying out process. Here’s how they look after 30 minutes. These are not cooked. Do not eat them. Yet. Leave them in the oven and crank the heat up to 425°F and cook 40-50 minutes more, until golden brown and so crispy. This easy decadent homemade Buffalo sauce will blow your mind! Wasn’t that easy? And no pot full of hot oil to dispose of either. So awesome. Scroll down to find the printable version of the above instructions. Take wings out and let rest 5 minutes. Toss in a delicious sauce like this one and serve. Adapted from Cook's Country. The science behind it all can be found here on Serious Eats. Video by Leigh Olson. Photos by Christine Pittman. This was awesome! What a cool trick adding the baking powder! I personally marinated it before hand and added the baking powder into it. It came out great! Very moist, not overdone, and so yummy….I’ve never been able to get the chicken that crisp in the oven!!! And not burnt!!! That’s even more important! Thanks again! Penni, Isn’t it the coolest thing? We couldn’t believe how crispy they got either. So happy you liked them! Cory, no, do not cover it. I followed the recipe exactly and was worried about cook time because the wings I had looked a little puny in comparison to these. Nevertheless, they were -amazing-. 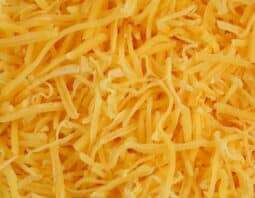 They coating is thin and not a thick, batter like coating that you would get at a restaurant. I’m not sure I would able to tell the difference between these and “naked” wings from a restaurant except for the fact that these wings were really moist. I really enjoyed them and look forward to using the same baking-powder trick for other proteins. I used Canadian NO NAME brand Baking Powder. Danielle, Yes, the coating isn’t meant to be a breading or batter. There’s very very little of it. The coating is just meant to change the ph level of the wings so that they crisp better. I’m really glad you liked them! Sandy, I’m really not sure. It is possible that there is food or grease on the burners in your oven. If this is the case, then they need to be cleaned. You might also want to get a free-standing thermometer for your oven so you can see if the temperature is correct. I put a layer of salt under the rack. It catches the drippings and grease. No smoking. Torrie, Great idea! Thanks for sharing! I always have the same problem (definitely not because my oven is unclean). The way around that I’ve found is to use a deeper pan beneath the wire rack and place parchment paper (or something else that won’t conduct too much heat and can stand up to the temperature) between the rack and the bottom of the pan. You have to make sure that the parchment paper doesn’t actually touch the bottom of the pan though as it’s more likely to burn then. This way the fat collects on the paper Instead of the hot metal pan. In my case, the rack holds the paper in place, but if that doesn’t work for you, I’m not really sure what to suggest. Hope this helps! Thanks for the advice, Dominick!! Can you please tell me if anyone has ever tried this on chicken legs or breasts? I tried it on legs last night because I LOVE the wing, but I didn’t have the recipe in front of me and I put way to much baking powder. I had to take the outside off completely but I really want to know how much to use. Thank you so much for a wonderful recipe! Tami, I did see it somewhere in the comments. I tried it on thighs once and it wasn’t ideal. I keep meaning to try again. 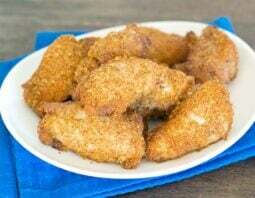 I tried this on both drumsticks and thighs , added a homemade creole seasoning for flavour and they were nice and crispy with a tiny bit of heat . 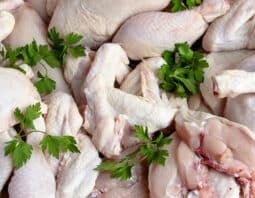 I recommend trying it out on any chicken with skin on , going to try it on chicken breast to see if I couldn’t have the breast stay a little juicier! Brent, For breasts, I think they will dry out if you cook them that long at that high of a heat. But totally worth a shot! Let me know how they turned out. And so happy the drumsticks and thighs worked! Sheree, Are you sure that you used baking powder and not baking soda? You shouldn’t be able to taste it at all. It just tastes like salt, really. I used baking powder too. Tasted like baking powder. The wings could have held onto too much baking powder. Maybe using a touch of BP in seasoned flour. Liane, I’m honestly confused by this. I’ve made them so many times and can’t taste the baking powder at all. I don’t think you’d want to use flour though. The idea is not to coat the wings like a breading at all. The baking powder is just there to change the acidity of the wings. That’s why there is so little baking powder called for in the recipe. I’ve seen this before! Some people are highly sensitive to the taste of baking powder. Maybe it’s genetics? Jenny, This is so interesting. Thank you! I wonder if it is genetic. The article you referenced notes that there are two kinds of baking powder. When I get a chance I’m going to do a test with the two kinds and make sure that they both yield the crispy results, check if one tastes more bitter in the final result than the other and then I’ll make a recommendation in the article. I love a good cooking experiment!! The first time I made these, I accidentally used baking powder with aluminum. The taste is totally different, and very unpleasant (unless you like a slightly chemically, bitter taste). Since then I’ve only used aluminum free baking powder, and the wings are wonderful! It’s very important to get the right ingredient. Susan, Thanks for letting me know. I am planning on doing a taste test using the two types of baking powder but from what you’ve said, I am pretty sure that there will be a noticeable difference. I have found that if the wings are wet or too moist they retain too much of the powder. I dry the wings with paper towels and toss with the powder mix in a ziplock bag. They get a very thin coating and you dont notice the baking powder taste at all. Hello, if you are going to do a dry rub on them, would you put it on at the same time as the baking powder and salt or would that not work? Amy, yes you can. I think if you read through the comments here you’ll see that several people have tried that and been happy with the results. I made these tonight for the Superbowl. I used the Rumford- Aluminum free brand. They turned out so delicious! Will be making again! Afton, So happy you liked them!! I’ve tried this recipe, and love it. I first found it on another website, and it says to dry the wings well before putting in a bag with the baking soda and shaking to coat. By drying them, they only get a very light covering with the baking soda. I would think if the chicken is too wet, they would take on too much. I tried this last night. It was great!!!! I have tried a lot of reciepes to get this crispness, finally found the answer. Thanks, I’ll be using this often and sharing Pinterest. Shelia, Thanks so much for letting us know. Delighted that you liked it and that you’re sharing it. I <3 Pinterest! Can please send my the recipe on how you marinade your Chicken, how long you marinated it. And what you set your oven to. I’m diabetic and need to find new ways to cook healthier. This recipe doesn’t involve a marinade. You just start with plain chicken wings. I tried this recipe was because I didn’t have the time to deal with the oil and washing the fryer tonight. While I won’t go so far as to say this is better than a deep-fried wing, it was pretty damned good. I started with a Costco (Canada) pack of chicken wings. It yielded me 20 wingettes and 33 drummettes. So I decided to (kinda) follow the recipe at 2.5x. 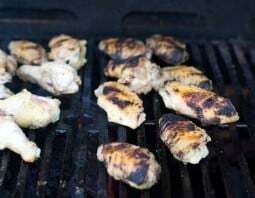 I like a marinated wing – so I marinated the wings with a dry spice mixture using 1 tsp of salt, 2 tsp of large-grind black pepper (Costco restaurant grind), 1 tsp of garlic powder, 2 tsp of paprika, and 1 tablespoon of Club House Italiano seasoning. I coated the wings with this spice mixture and then placed in the fridge for four hours. Just before baking I mixed in 2.5 tablespoons of Magic Baking Powder (which google says is aluminum free). I also modified the cooking instructions using the convection setting on my oven. I started with Convection BAKE at 250 for 30 minutes, then used Convection ROAST at 400 for 40 minutes. Overall, I’m very impressed and will definitely try this method again. Next time, I might add a bit more salt (for my taste) and maybe a little heat like some chipotle chili powder or cayenne. My wings were mostly on the smaller side and were done at 40 minutes, I probably could have pulled them out 5 minutes earlier. Corina, Glad you liked them. Your seasonings sound delicious! I do not see much of a difference at all in convection times as opposed to the regular??? Am I missing something? Just made these. I was skeptical at first. But tried it and what do know! I will be doing this process from now on. Glad I tried it. Thank You. You’re welcome. So happy you liked them. It’s pretty amazing, right? Can you double or triple the amount of baking powder and salt per 10 wing? Say I have 30 wings I need to cook can I use three tablespoons baking powder and one and a half teaspoon of salt for all of those and can I use my seasonings in addition to the baking powder and salt? Karen, Yes. Just make sure that you’re talking about 30 whole wings. You’ll cut each one in half so you end up with 60 pieces. If you have 60 pieces, then yes, 3 tablespoons of baking powder and 1 and 1/2 teaspoons of salt. You’d need a very big bowl to get them all in and to toss them well. I’d consider doing half or a third at a time in the bowl just to make sure the powder and salt are distributed. And yes, you can add other seasonings. Marsh, the recipes don’t need to be opened. They’re already there. If you’re on a mobile device, sometimes you need to click “Read more” in the blog post to get to the recipe. Loved this recipe. Shared, now my daughter and her husband love it. Best recipe i have found for crispy wings without frying, thank you, my hubby thanks you too!! Sara, I’m sorry they didn’t work for you. Can you explain what was wrong? Most people really love them so it’s informative to find out what can go wrong and try to fix it so others don’t have the same issue. In the oven right now! I forgot to put on the bottom rack for the first 30 , but the house smells great. I have about 10 minutes to go at 425°, so excited. I love crispy wings and deep frying, but the aroma remains in the house for 2-3 days. So mama and I are getting ready to experiment. She likes honey BBQ, and I like Texas Pete or Frank’s with. Bleu cheese. Update you soon!! do you have to flip the wings over at all? No. Just leave them as they are on the rack. Hello, I normally bake my sauce on the wings at the end, would that make them less cripsy? Dawn, it might make them less crispy. I typically toss the wings in a bowl with sauce after baking them. You can warm up the sauce a bit in the microwave or not. It doesn’t seem to matter. I don’t have a rack but I want to try this. Will it make a huge difference? Anesia, I don’t think it will make a huge difference. Maybe flip them over halfway through so that the bottoms aren’t soggy. If you happen to use a silicone baking item called the pyramid pan, you will want to flip them part of the way through the final cooking phase so both sides get crispy. I couldn’t seem to find baking racks at the stores near me for some reason, so I went with what I could find. Great cooking method though. Reminds me of the wing joint without all the grease. Great tip, Philip. Thank you! I coat them anddry them on the racks overnight gives them the right chewiness and more like fries wings. Randy, That’s interesting. So you coat them in the baking powder and salt mixture and then dry them overnight? Or you coat them in something else? Can these be marinated in sauce overnight first? Or do they have to be dry when the baking powder goes on? And could cornstarch be added to the baking powder mixture, or would that ruin it? Mila, I haven’t tried either of the things you’ve asked so I’m not positive. I think a marinade would work if you drained it off and then patted the wings very dry before adding the baking powder and salt. I’m not sure what cornstarch would do, to be honest. If you want to try it, I’d say make a batch as explained above but then put some cornstarch in with just a few of the wings. THen you get wings that turn out correctly for sure, and on the side a little test batch to see. Great question, Joe! 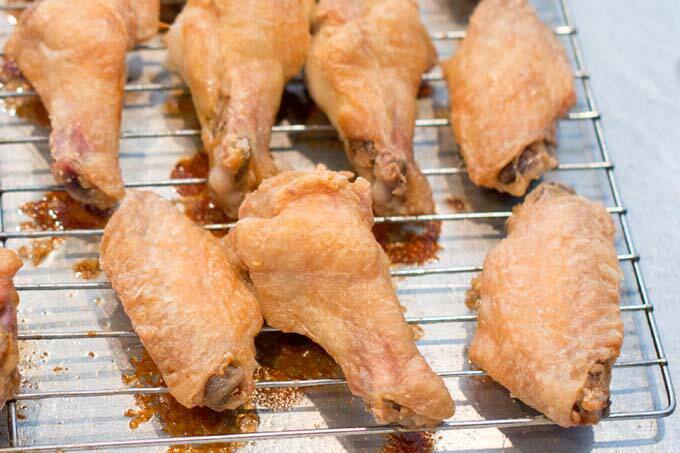 Baking soda has a strong flavor that is detectable on the finished wings. The baking powder, which has baking soda in it and is thus also alkali, but not as much, has much less flavor and is not detectable on the finished wings. Your recipe calls for 1tbsp for 10 wings; however, in the picture, it looks like alot more baking powder than 1 tbsp. Can you advise if this is 1tbsp per wing? How does 1 tbsp coat 10 wings or am I missing something? It really is just one tablespoon. In that picture it’s sprinkled a bit around. Spoon a level tablespoon of baking powder over your bowl of wings. Add the salt too. Then toss them around until it has been well-distributed. This is not like a breading. This is just a very thin layer that is meant to change the PH of the wings so that they can crisp more easily. I don’t have a cooking rack. 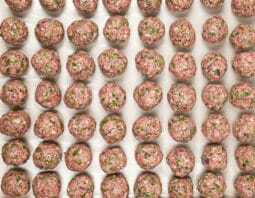 Is it okay to cook them on a backing sheet? Melissa, They won’t crisp up on the bottom. I’m not positive it would work but you could try flipping them over halfway through. Dollar Tree has the cooling racks 2 for a dollar. I stocked up to make jerky, and they work great for these. The dollar tree! great idea, April. Thanks for the tip! I tried this recipe and I am blown away by how good the wings came out. Thank you so much. I cant believe what came out of my own oven. Delicious. KD, Thanks for letting us know. We love this technique too! Fancy, Ha! So happy you liked them! They are delicious! Making them for the third time tonight. Trying a little seasoned salt tonight along with the baking powder. Then I’ll toss in some special sauce. Thank you for my favorite wing recipe. Charlie, You’re welcome and thanks for letting me know that you like them so much! You’ve made my day! Can I use flour instead of baking powder? My husband has a very strange reaction to baking powder. Alayna, No, unfortunately you can’t. The reason for using the baking powder is to change the Ph level of the chicken, not to bread it. You can use baking soda, but less of it. And it actually has an odd salty metallic taste so you may end up not liking that. If there is something about baking powder your husband doesn’t like, figure out if it’s the baking soda in it, the corn starch, or the cream of tartar. You can get cream of tartar at a bulk food place, and mix in the baking soda yourself if you want to avoid the corn starch for a lower carb recipe, for instance. Robin, Thanks so much for letting me know that you liked out they turned out. It is pretty amazing, isn’t it? Yes yes yes! Finally it works and love them! Still in the oven, but im exctied to try these! These turned out to be awesome! This will definitely be my go to wing recipe! Renee, Fantastic! Thank you so much for letting us know! Oh ha! I just saw this. So you did it with soda first then rinsed and used powder. The soda actually has the same effect as the powder but it can leave a bad taste on the wings. Good job catching the mistake and correcting for it. Again, so happy they turned out for you! I believe the general feeling these days is that you should not rinse chicken before cooking. The rinsing spreads bacteria around the kitchen. Just start with plain raw wings and follow the recipe as is. Sounds great, of course the wings have to be thawed out right?because I always get the bag of pre frozen kind and just toss in the oven, I hope can find some baking racks at the 99 cent store. Yes, thawed first. But this recipe is for unprepared wings. If you buy ones that already have a coating or seasoning or sauce on them, then don’t use this recipe. It would be very helpful if the ENTIRE directions were given in each of the descriptions. Seems worthless if you are following them and later find out there are more complete instructions way down the page. Jack, I understand what you mean. The photo tutorial is meant to be a visual demonstration of the process, much like when you watch a cooking show and they demo the process but you need to go to their website to get all the amounts and times, etc.. Regardless, I went in and added the ingredient amounts since that seemed to be the only thing missing from the top. I hope that helps. This is by far the best way to cook your wings…I love wings…I tried them 10 differnt ways at least. This hands down kills the competition. I would not change it. I wouldn’t do anything. Follow the recipe, you will be impressed! Connor, Thanks for letting us know they worked for you. Yay! These were not good at all! You could taste the baking powder completely and it left a horrible chemical taste in your mouth. No doubt they were crispy but hey were inedible due to the off putting taste. Jessica, This is strange to hear. I’ve made these so many times and you cannot taste the baking powder at all. I’m curious, are you certain you used baking powder and not baking soda? I know that baking soda leaves a terrible taste whereas baking powder leaves no taste at all. I followed the recipe exactly, my wings didnot get golden brown, I had to put the oven temp to 450 degrees. Luckily the wings then came out golden, crispy and moist. The other headache was cleaning the oven racks, I was tempted to rub the racks with olive oil prior to placing the wings on it. My wings stuck to the rack. Anna, I’m glad the increase in oven temperature worked for you. I’ve used two different racks and did not have any sticking problems. But yes, perhaps rubbing with oil would help. Thanks for the feedback. I am making these for a second time. I added the baking powder to some sewsonded flour as we like a little breading.and they turned out great! Yhank you for the baking powder tip. Edna, That is great to know. I can’t wait to try it. Thanks! I would like to know if this process works for Chicken Thighs. If it does what would the temperature and times be? Ronnie, I did a test with chicken drumsticks and it didn’t work as I’d hoped. They were cooked through but not crispy like the wings get. If I try it again, I’ll do them at 450F instead of 425, minimally. Wow!! Definitely going to try this! I want to do it with a dry lemmon pepper rub. When would I put the rub on in the process?? I’d love to know how they don’t overcook and dry out at such long cooking times. I love baking chicken wings, and the recipe that I have been following for quite some time now has me baking my wings on a wire rack for 45 minutes @ 400 degrees. They always come out crispy on the outside and juicy on the inside. I understand that you only cook them at 250 degrees for 30 minutes, which is a low cooking temp, but then you crank it up to 425 and cook another 40-50 minutes? They aren’t like jerky when they are done? How is this possible? Michelle, the first round of cooking only manages to dry the skin a little bit. It doesn’t affect the meat. It does seem like a long time, but really, they don’t end up dried out at all. If you give it a try, let me know how they turn out for you. You replied that you tried your method on Chicken drumsticks, but did you try the method on Thighs? I did not try it on thighs but I suspect it would be very similar to the drumsticks since the meat to skin ratio and size of the chicken pieces is similar. Did you just forget to credit j.kenji lopez-alt/food lab/serioueats.com, or were you hoping noone would notice the use of all his work as your own? Wow, that’s pretty passive-agressive! 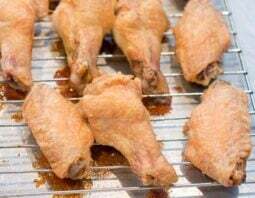 I have seen several recipes on various websites that use baking powder to get the wings crispy.who knows who came up with it for the very first time? She’s just sharing a recipe, not trying to make a million dollars off it! My great grandmother has been doing it this way since she was a young woman same with my grandmother and my mom. Dont be a troll. What a troll, this recipe is ancient. I don’t think she said she came up with it personally. She was just sharing and that’s what Pintest is. I for one can’t wait to try. Thanks for sharing!!! Can not wait to try this with wings but I am trying thighs tonight. We cook ours on a rack to try and get a little crispy. So hopefully this makes them even more so. Kathleen, Let me know how they turn out for you. I actually tried it with drumsticks awhile ago and it didn’t work as I’d hoped. I’m going to experiment with it again but if you have some success, I’d love to hear any pointers you uncovered. Thanks! It worked and my family of 6 loved it! The skins were nice and crisp. The only issue for me to change was I season with a garlic chicken herb and with the salt in that and the salt/baking powder combo it was too much. We cooked on 375 and bumped up to 425 right at the end. I am going to try starting lower next time like you mentioned. This was a keeper for sure! Oh and I am not a great cook and just learning. Love an easy idea! (NOTE TO READERS: Kathleen is talking about trying the above method on chicken thighs, not wings). Kathleen, delighted that you guys liked it. Yes, with the salt already, adding another salty seasoning wouldn’t be ideal. You could try a salt-free seasoning or just go in with some garlic powder (NOT garlic salt). Hello I just made your wing recipe for granddaughters birthday party they came out perfect thank you so much!!! Elisa, So happy you like it. Thanks for letting us know! Hope party was a success. Was skeptical but happily surprised! Dressed them with Sweet Baby Rays Wing Sauce…awesome! OMG! I rarely post a comment…..but I can’t believe how crispy these got! I threw in a couple of thighs…and they came out crispy too. I did flip them for about 10 minutes! They were fantastic too! Pamela, Good to know about the thighs. I tried it with drumsticks and it didn’t work. I’m going to try thighs next! Christine you are a genius! Andy, Interesting. Did they still get crispy? Very cool! Never tried baking powder or a rack will do definally next time! Thanks so much Christine!!!! I just made this at 2am!! They were incredible! I added pepper and Lawry’s seasoning along with the salt and baking powder. Plus I did not have a baking rack so I just flipped them half way for both baking session. I lined my pan with foil for easy clean up, I should have sprayed it with cooking spray. A few pieces stuck a little bit, but nothing tragic. I tossed the wings in Texas pete hot wing sauce. I will never fry again!! Ha! Sounds like a fabulous middle of the night snack. So happy they turned out for you! I am so happy to have found this recipe. I just bought 2 huge baking sheets and racks just to I can make it. I do have 3 questions. Can I use Cajun seasoned salt rather than regular salt? I am cooking 2 full pans at once so should I simply rotate them from top to bottom shelves thru the cooking times? 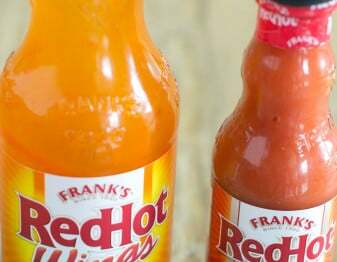 Have you tried putting sauce such as Franks Buffalo wing sauce during the baking? Think they would still come out crispy? Hi Deb, (1) Cajun seasoned salt should be fine. My only concern would be that it might contain some seasonings that could burn/blacken in that long cooking time. But I think it would still taste good. (2) Yes, rotate the pans halfway through. Whichever one is on the bottom at the end might need a bit of extra time at the top to finish off. (3) No, do not put the sauce on during the baking. Instead, toss the wings in sauce after baking them as instructed in the recipe. Put sauce in a big bowl and add wings. Stir. Add more sauce if needed and stir some more. Transfer to serving plate. Some sauce will get left behind in the bowl. That’s okay. Absolutely delicious! Best wings I’ve ever made! Love the crisp skin! Thanks loads! Gail, You’re welcome. So happy they turned out so well for you! I live in a house full of men (husband and 2 teenage boys) who can eat their weight in wings. I’ve tried several different methods; we have an indoor electric turkey fryer that allowed us to fry up enough to satisfy them, but now THIS is our go to recipie!! Way less mess than frying and just as crispy (which I couldn’t believe)! I only wish they didn’t take over an hour to make so we could start eating faster!! A must try for true wing lovers! Angela, So happy you guys like them! Yay! Thanks for the tip. It’s a great idea and I don’t have to pay Cooks Country’s fees to use their website in order to get it. I generally don’t have problems with wings. Make them so much, they’re my hubby’s favorite, but I am going to try this. Tegley, You’re welcome. Hope you like them! 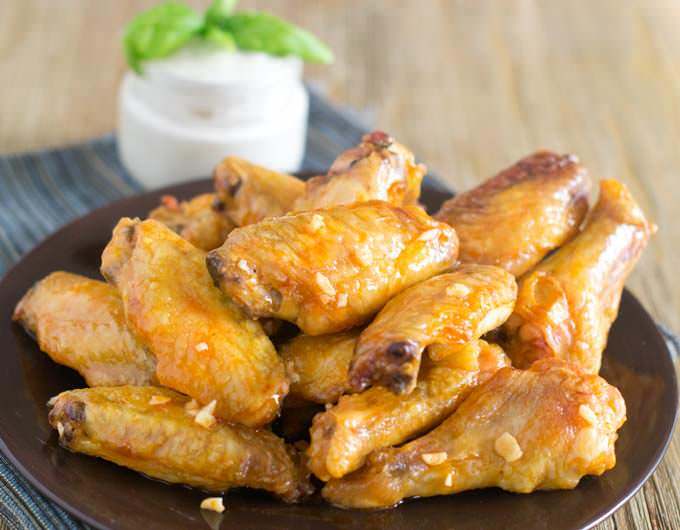 Hi just wanted to know if the wings can be reheated or kept crisp if I put them in a newcomer. These are for a church party and they only have chaffing dishes. What do you think? Susan, I’m not sure I know what a newcomer is. But as to the chaffing dishes, it is likely that the wings would not stay crisp. especially those on the bottom. But that might take awhile to happen and I think they would still taste good. Peter, So so happy you liked them. I’m craving them now! so when you crank up the heat to 425°F, do you leave them in the oven or take them out, wait for the oven to get that hot and then put em back in? I pulled my wings from the freezer yesterday and put them in the fridge to defrost but they are still frozen, should I wait till they defrost and use it for tomorrow or is there a way I can still use them tonight? Tammy, I saw this too late. They need to be defrosted. But for future notice, if they’re in a sealed bag, put the bag in a sinkful of cold water. They’ll defrost more quickly. Check them every hour. Hi. Christine, after searching for bake wing receipe, I found yours. I’m so glad I did!! The wings came out great by following your directions and yes to those that dont believe 1 tbsp of baking powder does the trick – well it only takes 1 tbsp! Instead of salt I seasoned with garlic salt & blk pepper, OMG. Thank you so much gor sharing. Terry, thanks for letting me know that you liked them. I know, that baking powder trick is amazing. I couldn’t believe it either! Can u use drumettes instead? Robert, Yes, I think that drumettes would work. If you try it, please come back and let us know if it turns out. Thanks! I mix cyanne pepper, (dry) basil, oregano, smoked paperika, garlic powder, onion powder, salt, pepper and baking powder in an old bread bag then shake the dried wings till coated. Give’s a great flavor without wet sauce. They come out great. Love this baking powder trick. Paprika. Auto correct. Lol. And if anyone is temped to coat the racks with Pam, DON’T. It does not hold up to high temp and smokes. I also line my bottom sheet with foil and get no smoke in the kitchen. Wendy, Great tip about not using cooking spray to coat the racks. I have found that the wings do stick a tiny bit sometimes. But I use a flat metal spatula to get under them and they pop off pretty good. The foil on the bottom sheet is a great idea to make clean up quicker. Thank you! Wendy, that sounds delicious. I tend to add a dry rub after they’re cooked. I’m totally going to try adding it before next time. Thanks I had forgotten this way of oven baking chicken. I wont do that again. The chicken turned out amazing. I’ll be doing these every Saturday and Sunday throughout football season. You will make me the hot wing god at the parties. I’ll may cooking friends link to this site. Abe, So glad you liked them. And no, don’t forget again! Happy football season! i just tried these last week and the crisp was perfect, although it came out a little salty. Can i do away with the salt or maybe.. half of what the recipe calls for? let me know, thank you! RonaMay, Yes. The salt is not required for the crisping effect. I don’t usually find these too salty though. Are you sure you used the correct number of wings? Just making sure. It’s 10 whole wings, each cut into two pieces, so that’s 20 chicken pieces. I’m trying this with boneless wings (i.e., chicken tenders that I cut into “boneless wing” sized pieces) – can you suggest how I might adjust the cooking time (both the first 250º part and the high temp part)? I’d appreciate any tips you might have! Claire, I don’t think you can use this method with chicken tenders for two reasons. First, chicken tenders don’t have skin on them so they will not get crispy like the wings. The baking powder will serve no purpose. Second, chicken tenders are white meat and will be very overcooked in the time given. My boneless wing recipe is over here https://thecookful.com/how-to-make-boneless-chicken-wings/ It uses boneless thighs that are breaded and cooked for 25-30 minutes. You could try using the chicken tenders and then cook for less long. They might not brown as well though. Worth trying. I was wondering if I can do the whole wing I am one of those people who love the crispy end of the wing and do not want to cut it off will I need more baking powder then? Andrea, Yes, you can do the whole wings. I just tried it like that a couple of weeks ago. Those wing tips got so crunchy and delicious. I didn’t increase the baking powder although you could be just a little bit to make up for it. Belinda, Yes, they’re good as dry wings too. Just add salt and pepper or other dry seasoning when you take them out of the oven. I’m making these now is it ok that I seasoned them then add the baking powder ? Dawn, Yes you can season them along with the baking powder. I tried these wings as a healthy alternative to fried wings which I LOVE!! I was slightly skeptical before trying this, but I am now a firm believer!! The wings crisp up beautifully. I season the wings with my own seasonings first and then toss them with the baking powder. They are super crispy and I have now been using this recipe for two months. My sister loves them also. Angela, Thank you for letting me know how much you like them. It’s become our go-to recipe as well. So crispy. It’s amazing! Cindy, That sounds delicious. Great idea! So do you mix seasoning with the baking powder and mix it together! I’m trying them for my husbands bday party!!! You can mix seasoning with the baking powder. Or cook them as instructed in the recipe and then add seasonings at the end. I noticed some people mentioned bottom oven rack. Did you do your wings on the middle rack? I think the very bottom oven rack would be too hot, no? Looking forward to doing this recipe. Susan, I’ve actually done it on all the racks in my oven and haven’t noticed a difference. Usually when I make these I do two big panfuls at once and so one is on the top and one on the bottom. Sometimes I remember to switch them around but sometimes I don’t. It might depend on your oven though so do keep an eye on them. I haven’t tried it but I believe others in the comments here have with good results. Maybe do a test for dinner one night before making a big batch for church. I put my salt and baking powder in a paper bag, toss in one wing at a time, and shake! Easy! I cook them on a foil lined cookie sheet with little sides. I haven’t needed to turn them over; they’re terrific! Thanks. Laura, Thanks for the paper bag tip. Great idea! So happy you like them! Can I make extra and freeze or will it lose its crispness? I think they’ll lose their crispiness. Sorry! I tried these with drumsticks and they turned out really well. Thank you. So simple. Lisa, Was the skin nice and crispy? I get a lot of people asking if they can do this recipe with thighs or drumsticks. It would be great to know. Thanks! I tried it once and it didn’t work well. However, other commenters have tried it and said that it does work. I’m going to try again soon with both thighs and drumsticks. If you do give it a try, let us know how it turns out. It’s definitely worth a shot. Nothing will go wrong. Mine just didn’t get as crispy as the wings do. They were still tasty! I’m going to try this recipe tonight but I have two questions. 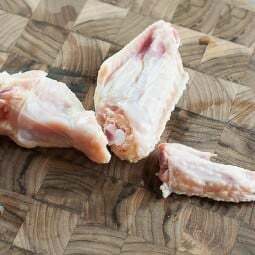 Can I use the whole chicken wing without cutting it? And if yes, what would be the ratio of seasonings to whole chicken wings? Also can I add some spices like garlic powder and onion powder to the baking powder/salt mix? or will it burn when I do the second part of the cooking? Karen, Great questions! Yes, you can use the whole wings. Use 10 wings, don’t cut them and use the same amount of baking powder and salt as listed in the recipe. I would hold off on seasonings until after the wings are done. The chance of the seasonings burning is there. Although note that I believe other commenters here have said that they added seasoning at the beginning and it worked. I made these a month ago. Came out great as far as taste. However I had a problem with the oven smoking at the 425 degrees. I had to open both doors im the house to let smoke out. Also, mine were done in about 35 minutes. These are great wings but any suggestions with the smoke? I want to do these for a party. Possibly with a lower temp for longer? Amy, I’m not sure why your oven would smoke. Did you have a solid pan under the rack that the wings were on? Without it, fat drips from the wings onto the oven bottom and that can smoke and burn. Actually, drips from previous cooking can do that as well. Your wings were done early as well. Do you have a stand-alone thermometer in your oven? You can buy them at the grocery store usually and then set it on a rack in your oven. This is to see if the temperature of your oven is accurate. It could be that yours runs high. I know you’ve had plenty of comments but I just wanted to add my own as well. 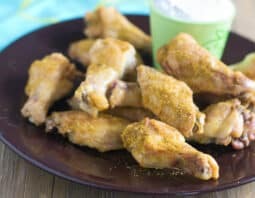 I made this recipe last month and they turned out so good, my 8-year old said, ‘These are better than Buffalo Wild Wings!’. I tried them three ways; with a dry salt & pepper rub, with Sweet Baby Ray’s, and with a mild (Louisiana Hot Sauce and butter) sauce. We both agreed we liked the dry rub because they were just SO crispy. I posted your link to Facebook and told everyone to make them – my parents made them two days later because they couldn’t stand listening to me any longer and agreed that they were amazing. I’m going to be doing a wing night tomorrow night and am going to try a couple more varieties, but I expect they’ll all be incredible. Thanks again for posting :-). Cathi, Wow! I love how much you love them. I love them that much too. I keep meaning to try oiling my rack and then forget every time. If you remember, do come back and let us know if it helped with the sticking. Thank you! Christine, we tried your recipe tonight! Best oven baked wings! I added my spices as well and barely needed any sauce! We will be doing this again! Trying other meats this way as well! Yummy! 10/10 in our book! Thank you soooooo much! We have been looking for a baked crispy wing! Not oil fried! Thank you! Denise, Thank you! So happy you like it! So, my wings are baking….. but the oven keeps getting duper smokey, did I do something wrong? THANK YOU in advance for the advice. Erica, Do you have a pan under the rack that the wings are on? If not, the fat from the wings drips down into your oven and makes it smokey. Also, if there is potentially fat in your oven from previous cooking, that can smoke. Finally, you might want to get a stand alone oven thermometer to put on a shelf in your oven and make sure that the temperature you think your oven is at is really the temperature inside. It could be that it is hotter in there than it should be. Should the wings be thawed out before baking? Hi Erica – Your oven may be smoking if there are food remnants left from previous cooking as Christine mentioned or did you by chance over oil the racks and/or baking sheets ? If you did then there’s a chance some oil pooled and started smoking once the oven became really hot. I can’t really think of any other reason. I’ve been making wings this way for years and I’ve never had an issue with the smoking oven. These are okay. Probably good if you don’t have a deep fryer. But, they aren’t remotely close to to the product that comes out of hot oil. And that’s exactly what I’m personally looking for – deep-fryer results without the deep fryer. I can’t wait to try these. Two simple ingredients. Who knew it could be so easy? Linda, I hope they worked out for you! Alyssa, You could try doing them straight on a greased cookie sheet. My only concern is that they might only be crunchy on the tops, not all the way around. You could try flipping them halfway through. I’m not sure if it will work because I haven’t tried it. If you try it, please come back and let us know. I am going to try your recipe this afternoon. Do you ever turn the wings part way though the cook or no need to? Very yummy in my family’s tummy. These are amazing. When I found this recipe, I decided to give it a shot, and I really couldn’t believe how well they turned out. It’s been a little over a month, and my husband has asked me to make these once a week ever since. He just can’t get enough. Looks like we’ll be having wings every week until he gets sick of them. As many different ways as I’ve made wings in the oven, and always thought they were good, this recipe beats everything else, hands down. I’ll never do it differently again. Christie, I’m delighted that you guys like it so much. Thanks for letting us know! Hi! I’ve made these several times since Thanksgiving — my family LOVES them… thank you! I’m curious if I can refrigerate them and then reheat them? I’d like to make them to take to a party; but won’t be able to bake that day. Any suggestions? Thanks! Janene, So happy to hear that you like them. Yes, you can refrigerate and reheat them. They’re not quite as crispy but still good. Cook them and then refrigerate them uncovered for up to 24 hours. Put them on a baking sheet and bake at 450F until heated through and crisp again, around 20 minutes. Could you give me the amounts of baking powder and salt I’d need to add to 3lbs of frozen wings that I am defrosting? Alyce, for 3 pounds i would double the amount listed in the recipe. Ok, I am going to try this tonight, can hardly wait!! 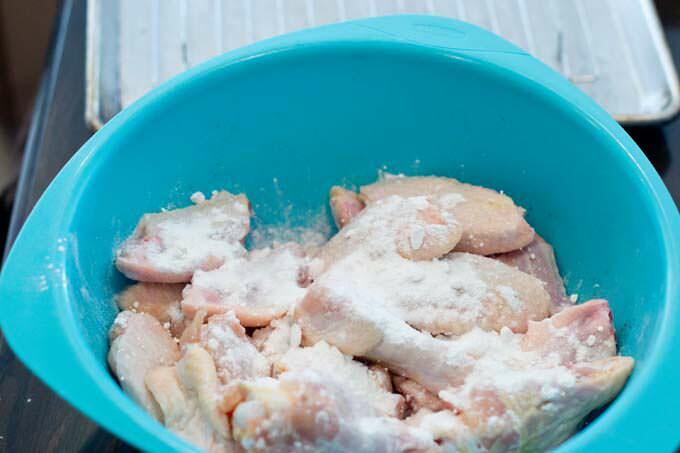 Do you think this baking soda method would work with full-size, regular, cut-up oven baked chicken?? I suspect that it would, but I was just wondering if you had tried it. David, Please make sure that you use baking powder and not baking soda. I tried using chicken pieces once and it didn’t seem to work. However, others in this comment section have tried it and liked it. Definitely don’t try it on breasts. You need to use dark meat. The breasts will dry out if you cook them that long. I’m trying this tonight. This may have already been covered, but do you adjust the times and ingredients directly if you cook more than 10 at once? Meaning if you’re preparing 30 total wings would you then use 3 tablespoons of baking powder AND cook at 250 for the first step for 1.5 hours? Please advise. Without knowing for sure, Im doing at least 45-60 minutes and go by sight to determine if it’s time to move on for now. I like extra extra crispy wings so I’m guessing I can only do so much harm. Let me know though. Thanks for the recipe! Shawn, yes, you would adjust the amount of the baking powder used. But you do not need to change the cooking time at all. Just make sure the wings are spaced out with room for the hot air in the oven to circulate around each one. Also, to speak to your comments regarding baking soda. I recall using baking soda for a Jamaican recipe for a college class. I used more than the recipe called for thinking no way is this enough. It pretty much ruined the recipe. Thus, if anyone uses baking soda, DO NOT use a lot. You will likely be disappointed. Shawn, exactly. Don’t use baking soda at all for these. Please use baking powder. This recipe is fool proof! I never leave replies or reviews, but this one is almost magical. Good enough to eat these without any sauce. I didn’t have a baking rack so I used a broiler pan. I did turn them over after the first cooking about half way through, but I didn’t when I turned up the heat. They came out perfectly! Thank you Christine. Karla, You’re welcome. I love this recipe too. Thanks for letting me know. This recipe is awesome. I can not bread my wings and I do not enjoy frying at home. These wings are amazing…every time. Thanks! Thanks Andrea! I make them all the time and love them too. Can I brine the wings first? Maura, I don’t think so but I’m not sure since I haven’t tried it. The wings end up juicy on the inside in the end without brining though. Oh. My. Goodness! I was looking for a chicken wing recipe for today’s football game and these are a-mazing! I usually don’t like wings because I can’t stand slimy chicken skin but these are so crisp I can’t stop eating them. My husband says these are the best homemade wings ever. Ann, Yay! So happy you guys liked them so much! Thanks for sharing this recipe. 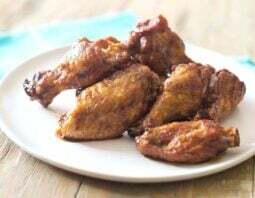 Try making these wings in an air fryer! tried this with 10lbs of wings and they were a success! I think the rack makes a big difference. We had to pour out alot of grease that would have made the chicken soggy if it wasn’t for the rack. next time, I would line the pan with some aluminum foil so it would be easier to clean up. We also added some seasoning to the baking powder and still worked out great. thank you so much for this tip. TK, Fantastic! Yes, lining the pan with foil is a great idea. Thanks! Mat, If you mean chicken drumsticks, I’d go with 1 tablespoon of baking powder. If you mean 10 whole chicken legs (drumstick with thighs attached) I’d go with 2 tablespoons of baking powder. If you try it, let me know how it turns out. I haven’t tried it with chicken legs. Hey Christine!!! It’s great that you respond to everyone. Thank you for sharing this recipe. I’m definitely doing this for the Super Bowl. I plan to have a batch of honey bbq wings & garlic parmesan wings. I’m so excited to try this recipe due to the numerous positive reviews. The only potential problem I have is the rack & the cookie sheet thing. I see your pictures and I think my racks are larger than the cookie/baking sheet I have. I don’t want to have all the ingredients, be ready to cook, & then find out I don’t have the proper cookware. I could be wrong & will go home to check the sizes. However, if my racks are larger, what other options are there? Do I have to go out & get a larger baking pan. If so, where should I go. I really want to make it exactly the way you do though lol. I’m not sure, Dana. If your rack is bigger than your pan, you might still be able to use it if it sits on the pan in a secure way. Then only put wings on the rack in places where the pan is below it. WHen removing the pan+rack from the oven, be careful to get under the pan and pick it up such that the rack doesn’t fall off. These were fantastic!! I used the baking powder and lemon pepper seasoning which has plenty of salt in it already and they turned out incredibly crispy!! I will be cooking them like this from now on!! Thanks for sharing! Bob, Yes, that will work. The initial stage just dries them out a bit. It’s even possible to chill them at that point and do the final bake later. Great question! will be trying this method tomorrow for the first time. sounds amazing, can’t wait. This is the wholly grail for the best “not” fried chicken. My husband can’t get enough of this deliciousness either. After cooking, I tossed with three different sauces. OMG! Ugh! RUINED MY WINGS! only tasted Baking Poweder aka salt bomb! Christopher, Are you sure you used baking powder and not baking soda? Baking powder doesn’t have a strong salty taste but baking soda really really does and is terrible if used in this recipe by mistake. Thanks for the great recipe. I followed the recipe exactly, and they turned out perfect. We used Blue Cheese dressing for a dip because we love it. I read several comments and will try different seasoning next time. Thanks again, we loved them!! Carol, Thanks for letting us know. We’re delighted that you liked them. This is a great recipe! I followed this recipe using drumsticks instead of wings (I didn’t want to cut up the wings). Nice and crispy. I coated drumsticks with baking powder to cover (I had about 15 drumsticks, so ended up using about 3 TB of Baking Powder). Sprinkled with salt (did not measure). After about 35 minutes at 250, I used olive oil to baste and then sprinkled with salt, pepper and Garlic powder. I cooked them at 400 for total time of an hour, turning half way. Re-basted and re-sprinkled at the half way mark. My oven runs hot, so I think 425 would be perfect. I let the guest pick their sauce afterwards: I offered a variety of hot sauce and BBQ. Or they could eat as it was. Great success! Love that I found this. Also, I used a broiler pan as I do not own oven racks. I did put butter on the top pan to ease the stickiness. Last time I tried this, the wings stuck to the pan pretty bad. I guess that would not happen if I had true oven racks! I would recommend aluminum foil on the bottom to help with the mess. Bonny, Thanks for the info. Your drumsticks sound fantastic! These were SO crispy! I had been STRUGGLING to figure out how to make crispy wings without frying them. This recipe is a LIFESAVER! Angie, so happy you liked them! I am in the “tastes like baking powder” camp. The crispiness was fine and the chicken was nicely done – but it had that floury flavor. Couldn’t get past that and I’ll be going back to Buffalo Wild Wings again. We did 20 wings with gluten free powder and 10 with regular powder and they all had that aftertaste that was quite unpleasant. It was worth a try but I am giving up on doing my own wings. Blair, Was either of your baking powders aluminum-free? That seems to be the issue, not whether it’s gluten-free. Made these for my boyfriend yesterday, he actually liked them🙌🏽. I’ve finally found a crispy wing recipe he actually like. He gave it a 3 out 4 stars. Officially going into my recipe binder. Ashley, Fantastic! So happy you guys liked them and that the recipe is binder-worthy! Can’t wait to try this….would the temp/time be the same for convection oven? Thanks in advance! I worked at a chicken wing place as the kitchen manager when i was younger so cooking wings were never a problem for me….. Now I have a wife who hates the oil smell and how long the smells ruins the house lol but this trick works great, same results as frying them but so much less of a pain for a small batch of wings. Now i do have a question, i’ve begun smoking my wings and they frying them. I’ve done it where the wings are smoked through to a done point and then fried and also just to a point where the wings were smoked, kinda like bacon, then fried to finish. 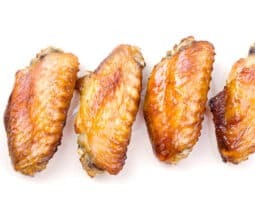 Do you think if I used this method with wings that were only smoked for flavor and not cooked would i be able to just bake them at 425 with the baking powder and salt and still achieve the crispy skins? Sheldon, Yes, I do think it would work. I’d do the baking powder prior to smoking. If you try it, do come back and let me know how they turned out. I’d love to know! I use cornstarch with flour…never tried the baking powder. I’ve never tried this. Does the flour make a coating on the wings, like a breading almost? I wonder what the cornstarch does in there. Om-Nom-nom! Can’t wait to try this!!! I followed the recipe exactly. 15 minutes into turning the oven up to 425, they were literally smoking. I had to crank the heat down to 400. Perhaps my oven just gets too hot. However, the end result produced a fairly crispy chicken wing that everyone seemed to enjoy. I served them plain without tossing them in anything and offered dipping sauces (BBQ sauce, ranch dressing and sriracha). Don’t think I’ll make them again, though, as they would have set my smoke alarm off if I hadn’t turned the heat down and now I’m gun-shy. Linda, it could be that your oven is too hot. You can get a thermometer that stands in your oven to test the temperature. However, if they got nice and crisp at 400F for you, you can just do them at that temperature. Hi Christine, I also faced the same problem with smoking in the whole oven. And after baking it, my whole house is full of the chicken smell. Not sure if it got to do with the function selected. I used bake function (both top n bottom heating) instead of grill function (only top heating). And realized my wings are crispy but a little dry. And I only bake at 425 for 20min. Joanne, I’m not sure what’s up. This never happens to me and I’ve made them at my place (tons of times) and at two friends’ places at this point. If I think of anything, I’ll let you know. had parchment paper in the bottom of my cookie sheets along with the racks had one heck of amess with splashing in the oven is it due to the parchment paper or do we have to clean our oven each time we make these .they did turn out good. Linda, I’m really not sure what happened. I don’t get any splashing, just a bit of dripping fat from the wings onto the pan below. Does anyone else know what might have gone wrong here? I tried this recipe tonight and they came out perfectly crisp and delicious. I’m adding this to my bag of cooking tricks. The only minor change I did was to add some garlic powder, onion powder, and smoked paprika (2 tsp of each) to the baking powder/salt combo before I mixed it into the chicken. I also made my version of hot Buffalo sauce (1/4 cup melted butter + 1/4 cup of Sriracha sauce, some additional hot sauce (to taste) and tsp of honey. Wife and kids loved it. Will definitely make this again. Thanks for sharing the recipe/technique. Jack, The sauce sounds great! So happy you all liked them. These were the best wings I’ve ever made! I did brine mine too. So good. Connie, brining sounds like an interesting twist. I’m going to have to try it! Can you make boneless wings using this method? I tried this recipe and they came out GREAT! My go-to whenever I crave Buffalo wings! Thank you! Fantastic, my tonight dinner was so delicious, thanks to the chicken wings cooked in your way, I changed the recipe just a bit I add 1/4 of seasoning salt + tiny bit of garlic powder and a bit of black pepper, the flavor was super. Juan, You’re welcome. And thanks for sharing your variation. It sounds great! Jamie, There is this strange thing with this recipe. Most people love it and don’t taste the baking powder at all. I know, for instance, that I’ve served these wings at parties and they disappear like crazy. Gobbled up. And also, there are lots of comments here from people who love these wings. And yet, there are a few people who have commented who really really taste the baking powder and find it terrible. I’m so sorry that you are one of them. I’m also sorry to discover that the aluminum-free didn’t help. I was counting on that. I had a thought. I’m just trying to troubleshoot here. Is it possible that you only made half as many wings as were called for in the recipe? The recipe calls for 10 whole wings, which some people might think means 10 wing pieces. I still think it’s confusing to people though because at a restaurant if you order 10 wings you actually get 10 wing pieces, which would have come from 5 whole chicken wings. You get 5 whole chicken wings and cut them into flats and drumettes, and the result is 10 wing pieces. I’ve gone in and edited the recipe and the post above to be very specific about the amount of wings involved. Whether you made this mistake or not, I figured it was good to clarify this amount issue for everyone who lands at this post. Thanks again for your feedback. lol. I soooo know this problem! I almost never bought wings for home or from a restaurant before. Now I have to force myself to not make them every single weekend! Glad you liked them! Ann, Thanks for letting me know. So happy you like it! They were very crispy, loved that part, but the meat was much too dry. This recipe tasted good but they just aren’t crispy enough. I made these wings months ago with great success. Bought some more wings today hoping to use your recipe. I googled it, unsure if I was on the right page until I read your comment about your nail varnish matching the bowl! I remembered that from last time! My boyfriend loves the baking powder hack. He is a chef and hadn’t heard of this method before. Thank you so much for your recipe, it’s phenomenal. P.S. This time I mixed some cayenne pepper, thyme, onion and garlic powder with the baking powder and salt. Tara, So happy you liked it, and that you found it again! Lisa, I think someone in the comments mentioned doing it without a rack. I think it will still work. Line the pan with foil and spray the foil well with baking spray. I’m not positive but you might want to flip the wings over 3/4 of the way through the high temperature baking. This was great! The wings turned out absolutely fantastic! Thank you so much for this recipe! So EASY and so AMAZING!! and I’m a sucky cook! Thank you! Can you please tell me, once the sauce is poured on after cooking, do the wings loose their crispiness and go soggy? Razia, maybe a tiny bit. If you eat them right away, they are still crisp. Like sauced wings at a restaurant. Do you think I can marinate the wings first? Or if I marinate, this method doesn’t work? Reiko, I’m not sure about marinating since that adds liquid. You could try, just maybe rinse them off and dry them off after. You can definitely do a seasoning rub for flavor if you don’t want to risk the marinade. they would loose too much crispness…. They will lose crispness. But you can put them back in the oven at a high temperature for a shorter time to reheat. Do you dry them before you toss them with the salt and baking powder? Tom, I don’t dry them. I don’t rinse them either. I start with them just as they are from the packet. What is interesting I just am cooking wings as you recipie states. I never looked at the comments till I’m sitting here with a cocktail. There are tons of them. Indicates to me every one loved them.I was in a rush and my wife needed the computer. You recipe was different and I’m a big lover on plain crispy wings. My wife is gluten free so many sauces prohibit her from eating wings unless she knows all the ingredients I hope that your recipe is awesome. Well you are correct. Those wings are awesome. I’ve been searching for wings like this since I had the plain wings at Wind Wings in Myrtle Beach, SC . Thank you! Do you think it would work to do the powder coating and the initial 250/30min cooking part the day before? Would they hold in the fridge until the next day? Or maybe even do the first parts in the morning and the second half of baking in the evening? Catie, yes. But keep them on the rack in a single layer when they’re in the fridge. This way, they will actually continue to dry out a little bit more, making them even crispier later. The wings were awesome , I finally found the best recipe in the world , thank you so much. It was really easy , they didn’t get dried out and were very crispy. Betty, You’re welcome. Thank you for the comment! I’ve been trying for a long time to make crispy chicken wings. This recipe is fantastic. This is the only way I will make wings . Thank u soooo much!!!! Sharon, Thanks so much and thank you for letting us know! Best wings ever!! We eat these once a week in my house now! Just wanted to say thanks!!! Awww…thanks! So glad you guys like them. Thanks for letting us know! I have half a bag of wings in the freezer. Made the first batch the regular baked way and hubby didn’t want me to make them again because of the soggy, slimy skin. Now I will try this recipe but am wondering if the aluminum-free baking powder is the only way to go. Christine, did you ever do your test using the aluminum free vs. the baking powder with sodium aluminum sulfate? I only have the kind with aluminum, so wondering if I need to buy the other kind before I try this recipe. Thanks, and I can’t wait to try this! Val, I have tested it and I don’t find a difference. But then, I am not one of the people who can taste that strong taste in the baking powder. I need to find someone who does have that issue and then test the two types of baking powders on them. I haven’t done that yet! I made these tonight. I do not have a wire rack, just a sheet pan, foil, and cooking spray. Did not seem to make a difference. I made sure to bake with the fatty skin sides up and immediately transferred to a paper towel lined plate after taking them out of the oven. Still came out crispy on both sides. Maybe a little fattier than with a wire rack, as the bottom side seems to get “fried” in its own fat, but they sure are tasty. Let them cool for a few minutes and they stayed crispy even after tossing in a lot of sauce. This is the secret I’ve been seeking for decades; thank you! Dan, you’re welcome and thanks for the info about how they turned out without the wire rack. A lot of people have asked me that so now I can show them your comment. I didn’t necessarily find this recipe here; I was actually wondering if it is better to back with skin side up or down… But after making wings this way several times now, I don’t ever want to go out for wings when I can make them this well at home. I MAKE space in my fridge for these to dry out more for a few hours or overnight for the skin to render even more. Prepping some now to bring to a friend’s surprise b’day party. I can’t recommend this method enough. If you don’t have baking powder, there is a way to make it with baking soda, cornstarch and/or cream of tartar. Yum!!! Susan, If they are plain, unseasoned, unbreaded wings then yes. Just thaw according to package instructions and then follow the recipe here. Glad you liked them! Hi, Love these wings! Will never buy them in a restaurant again. I have used only Rumfords baking powder for many years, as the aluminum is not a good thing to eat. Now I make my own aluminum and corn-free baking powder, as we are also corn-free. Works great and you never run out, and you save money.. Mix 1 t. Baking soda, and 2 t. cream of tartar. Make enough for about a month so it doesn’t lose action. Charlene, What a fantastic tip! I’m going to give it a try and then add it to the blog post up above. Thank you!!! Hey there! Thanks for the recipe! First time making hot wings and this was easy and delicious! Definitely will make this recipe again. Have to try this. Usually I steam my wings foe about 10-15 min to render some of the fat then bake them on parchment paper flipping half way. (You have to chill them 30 min afterwards) TheY come out quite crispy. Neext time I’ll try baking powder in addition to steaming. i will also try without steaming. Sounds good. Let us know how they turn out. LOVE this recipe!! I am a bonafide wing snob and these are truly the best wings I have ever had, bar-none!! I have a pan of them crisping away in the oven right now as I type!! This is my 4th go at them and they turn out perfect every-single-time…true story!! I also use the sauce recipe, but I do “jazz” it up a tad by using Frank’s buffalo wing sauce instead of hot sauce and for a little extra heat and drama, I add 2 HEAPING TBS. of Chili Garlic Sauce and go a little heavy-handed on the garlic and sometimes, I finish it off with a bit of melted butter in addition to the olive oil, just to soften and round out the flavors. Kudos to you!!! Fabulous recipe that me and my family will enjoy for years to come!!! Patti, You’ve made my day! Thank you so much for letting me know about how much you like it and about the tweaks you’ve made. Your sauce sounds amazing! Wow! I’m impressed. By far, the crispiest wings I’ve ever put in the oven. I will admit though, after an hour of total cooking time for our ‘party wings’, I drizzled some olive oil on them and turned the oven to broil (flipping often) to finish them up. My fiancé had been asking me if there’s a way to make crispy chicken that’s healthy. I found this recipe and made it last night. We both loved it. Very crispy! My only issue was the bottom of the chicken stuck to the rack a little. I had thought about spraying it with cooking spray but I wasn’t sure if that would interfere with the baking powder. Any ideas? Thanks! They came out nice and crispy., but not dry inside. (Was afraid it would be too long in the oven, but it wasn’t.) We used Hain brand organic GF baking powder. No adverse taste, but may use a tad less next time, thinking of it as a light “dusting” (and maybe try the shake and bake suggestion above or just a dredge). Not only were they crispier, but the sauce sticks to the wings much better, too,,,, thanks again. Hi, I have two batches of wings marinating (one in lemon juice salt and pepper and the other in soy sauce and honey). I was wondering if I could still use the baking powder method on marinated wings. If I dry them completely and then coat them in baking powder, wouldn’t they come out too salty since one batch already has a generous amount of salt and the other has pure sou sauce? Thanks so much! Shell, I’ve never tried this. If it works out, do come let us know though. I tried these today for the first time and they turned out really great. The only thing I added was cayenne pepper before cooking To give it a little more spice. The one tip I would say is that I used a meat thermometer to check the chicken wings about 20 minutes before they should have been done and they were already done. Maybe my local grocer (Kroger) Had smaller Wings in their chicken party pack? I don’t know but they would have definitely been overcooked had I not checked them. Just a suggestion. I love it when wings are crispy. What a great tip! Wow, wickedly good! Thanks for sharing this tip. I want to try this on drumsticks and chicken thighs next. I must have a “delicate palate” because I found the baking powder to have an off taste. I did brush them when finished with sauce and this masked the off taste. Next time I will just leave them naked and use the sauce at the end. Rose, it seems (if you read above) that some people do detect the baking powder while most people don’t. It’s such a strange thing. Sorry it didn’t work out for you. I am going to try this weekend but wanted to sous vide the wings first. My thought was to sv them so they were fully cooked, dry them and then coat with salt and baking powder. I will have time to let them rest overnight before baking.Any input on this change? Time and temp different? Matthew, I’m really not sure. I mean, they’re in the oven for such a long time. I’m worried that if they go in there fully cooked, they’ll end up dry. But I’m not postiive of that. The wing meat is so moist and the sous vide method is gentle. Good luck and let me know how they turn out, please. If you are unsure on how to make sauce, just buy regular old Franks hot sauce, and add it to melted butter in a saucepan, about 1/3 butter to 2/3 sauce will make a nice medium heat. I don’t think margarine, or olive oil or soy based, vegan, lactose free, non-GMO bread flavoring from Whole Foods will work, stick with butter. Thank you, Chris. I’m glad you found it too! Thanks for the tips! Most amazing wing recipe ever! No more $30 trips to the wing place! Hey, don’t be discouraged by the negative comments about this being an original recipe or whatever. I search for new recipes online often, this is a new one for me and I appreciate you posting it! I am trying it tonight and expect sensational results. Happy Cooking! i really wanted to make these wings tonight but did not have any aluminum free baking powder so I made my own. I looked it up as to how to . for those of you who do not have the correct baking powder or if you can’t find it, it is made as follows: 2 teaspoons of cream of tartar, 1 teaspoon baking soda, 1 teaspoon cornstarch. Paula, That’s great information. Thank you! I bought some wings and gonna cook em your way. I followed instructions like two years ago and loved them, so I’m sure they’ll turn out great. Hi Christine! I love chicken wings; however, I have always been intimidated by them. I have considered making them in my crock pot, but I am not impressed with the recipes. I want my wings crispy! I have decided to go for it and use your recipe. I just have one question. I want to make them before the Superbowl game this Sunday. If I make them, say, mid afternoon, will they maintain their crispiness when we eat later? If not, do you have any suggestions for when I should start them? Many thanks. LaWanda, They are best cooked right before you want to eat them. They won’t stay crisp for hours after that. I have had success re-crisping wings in the oven the next day. But if you’re going to have to re-cook them to do that, why not just cook them at the correct time? Note that once they go into the oven they’re really hands-off and you don’t have to worry about them. 1 hour and 15 minutes before you want to eat, mix the wings with the baking powder and salt and then put them into the 250F oven for 30 minutes. Then increase the heat and cook them for the extra 45 minutes. Toss with sauce if desired and serve. Enjoy! The wings I’m making are frozen. don’t have time for them to be completely thawed. Does that matter? Also, I don’t have a rack can I bake them with a broiler pan? thank you.. I tried this recipe today and followed the directions as stated. I DID NOT add baking powder and the wings were crispy and was the best wings I have made. Never would have thought to try the low to high temp change. Thanks for this. This will be the way I make wings from now on. Total fail. 25 minutes at 250° and then over an hour at 425°. NOT CRISPY. Not worthy of my wing sauce. There is no substitution for deep frying chicken wings. It was a nice try but total waste of money. Wings were well done and had no crisp or crunch. I made them today. I didnt read entire recipe so the time needed didnt fit my sched. I also didnt use a rack. I know. Why bother reading the recipe, huh? So i tossed some of the wings in aluminum-free baking powder (from Trader Joe’s!!! ), Salt, garlic powder, & pepper. I put in at 400 for 30 mins. Bingo! Perfect. Tiny bit oily cuz sitting on pan. Next time ill allow yr time allotment & use a rack. Best stumbled upon recipe ever! Turned out as if it was from a deep fryer. I can’t wait to make it again. Cheryl, So so happy you liked the wings. Thanks for letting us know! Thank you so much! I’ve used this recipe many times and my wings are so crispy! I’ve seen so many recipes but none compare to this one. I’m going to make me some low carb General Tso’s Chicken today with this method. Naomi, Tell me how the General Tso’s works out. What a great idea! Are you using wings or other kinds of chicken pieces? I’m intrigued. Amazing recipe… if you prefer a flavour you can add any dry rub…. like jerk or peri peri. i mixed 1 tbsp of dry peri peri rub, 1 tsp of black pepper. Some dry rubs already have salt so you don’t need it if you’re using a jerk or peri peri rub. Found your recipe online and tried it yesterday for the Daytona race. All my wings came out with a very powdery taste to them. The wings were pre tossed with a spice rub and left uncovered, in a rack in fridge for 20+hours. Prior to cooking they were then tossed in a ziplock bag with baking powder. Will try recipe again but will take extra time to really dry wings before coating with baking soda. Stephen, Make sure you’re using baking powder and not baking soda. Also, the amount of baking powder to use is very very small. The idea is NOT to end up with a breading or coating. It’s just enough powder to change the acidity of the wings, which is what leads to crispy skin. So make sure you’re not using too much. Finally, I’m not sure what was in the spice rub that you used. You can add the bit of baking powder to that spice rub mix and then refrigerate. That works. Have mad these many times and so good. I like mine served with coarse salt and coarse ground pepper and then grate lime zest over it for that nice fresh citrus flavour! Dave, I love the lime zest idea. Brilliant! Hmmm. I never thought about adding baking powder to the mix. Thanks for the recipe. I’m looking forward to trying it out in my new bbq smoker oven. Thank you! BEST RECIPE EVER!!! I can’t even order wings when we go out to a restaurant because they pale in comparison to this recipe. THANK YOU FOR SHARING. Caron, You’re welcome. I’m so happy you love it so much!!! I make mine the same way, with two exceptions. For one I use the shake and bake method (no bowl) no mess, and two I cook them at 450 degrees for 15 mins (seals the juiciness in) then at 425 degrees for 35 mins. One last thingy …… instead of salt I use garlic salt 1/2 tsp for every 6 to 8 wings (2nd section only). Yum Yum !! This sounds great, Rob. Thanks for sharing! I’ve lived in Buffalo, New York. This is my favorite recipe for chicken wings. Yes, it takes a long time, but it’s worth it. The skin is just as crispy as if it were fried, but the meat is surprisingly tender and juicy. The only things I would add it to spray your rack with spray oil and to remove the wings with a spatula to prevent anything sticking to the rack. Paul, I’m delighted that you like them so much. Great tip about spraying the rack and using a spatula. I assume you mean a metal spatula. That is what I use and it lets me get right under those wings. These were the BEST wings Ever!!!!!!!! These were amazing!! Even my non-meat-eating toddlers devoured them (with a lot of help). Definitely making many more times! Kaitlin, I’m delighted that you all loved them. Yay! Tonight is either my fourth or fifth time making these. Chicken wings are my kryptonite, and I love having this healthy version for crispy wings on hand. This recipe is such a life savor. I don’t see why I wouldn’t be making them this way forever! Anastasia, I feel the same way. I will never go back to any other way ever again! Kathleen, I am SO happy you loved them so much. Thank you for letting us know! Unbelievable! These are so fantastic I will never make them any other way! I didn’t believe it could be true and that simple but it really is. Thanks for this recipe! Sandy, you’re welcome. I love how much you liked them. Thank you for letting us know! I brined some wings then looked for a baked wing recipe. I think chicken always tastes better when brined. I followed the recipe exactly as written. Hands down the best baked wings ever! My husband sauced them up, I ate mine plain. This recipe is going into my collection. The wings were so crispy & moist. Kim, I’m delighted that you guys liked it so much. Interesting about the brine. I’ve never tried brining wings before but it’s great to know that the recipe works on brined wings too. I didn’t try the sauce only the wings! These are way better then deep fried. Thanks so much for putting this out there. It was so easy to make these and a big hit all around! This is our new go to for wings! Yay! Thanks for letting us know, Russ. I agree with EVERYONE else, these wings are seriously like chicken candy. I haven’t tried the sauce- my man is a weirdo and doesn’t like condiments… but these wings, are hands down, the crispiest and yet moist wings I’ve EVER had made at home. I am sad I didn’t do 40 and only did 20 wing parts. These are serve-to-guest worthy. I saw the cook time and freaked but they are SOOO worth the wait ♥ My next mission will be to see if homemade Paleo baking powder still gets them just as crispy as regular baking powder so I can stay fully Paleo compliant! Thanks so much!!!! Janelle, Is there baking soda (sodium bicarbonate) in your homemade baking powder? If so, it shoudl work. The whole idea is that the sodium bicarbonate changes the ph of the chicken skin, which is what lets it crisp so well. The reason we use baking powder instead of just using baking soda straight though is because baking soda has way too strong of a flavor by itself. In baking powder there are other ingredients so the baking soda flavor isn’t as prominent. Do you think it will work for pan fried method? I don’t have an oven. I forgot to toss them in the baking powder will it be a huge difference? Kandi, It’s the baking powder that changes the ph of the chicken so that it crisps up so much. So what I have found this becomes way to Smokey in the house! My trick is when you cook them you elevate them using a cookie cooling rack or my smoker racks are small engough for my pan, add water to the pan below it so when it drips it goes into water and not the pan. This allows it to not burn grease and keeps your house free from the burning chicken smell. Hope this works for you. Great recipe! Chris, Great tip! I know that when I make these I don’t have any issues with smoking but I have read about the problem a few times in the comments here. I hope this helps anyone having that issue. Thank you!!! I’ve used this recipe several times. I am really surprised at how crispy they get. I’m glad I no longer have to fry them. My tiny fryer can only do about 4-5 wings at a time, and I don’t really fry much else, so I usually have no idea what to do with the oil. It just seems like such a waste to use so much oil for just one meal. Angel, One of my favorite things about this recipe is how many wings you can do at a time. It is so much more convenient than frying, I agree. Thanks for your feedback! Does the baking powder & salt need to be applied relatively close to the start of cooking time? I typically season up my wings and let them sit or marinate overnight in the fridge. Would adding the baking powder & salt the night before result in wings that were dried out to a crisp prior to even starting cooking? Reggie, I’ve never tried it but I believe you can toss them and then put them on the tray in the fridge uncovered and that will make them even drier and even crispier. I’m not positive but you might even be able to skip the first cooking step at the low temperature if you do that. So this worked out well. I am currently making it for the second time today… right now. I rinse my wings first. Then i lime the up for more rinse (since i don’t have lemon juice; and to ensure to get the chicken smell out). I probably use more salt than in the recipe. Do the baking powder thing. THANK YOU FOR THE HEADS UP ON THE RUMFORD. I put my bigger baking rack (technically a cooling rack) on my flat pan (not a cookie sheet). The rack is slight bigger so ot sits on the lips on the ends of the pan. I put half the chicken on as is. And the other half get some dessert heat seasoning mix on it (I bought it from Buffalo Wild Wings). Then stuck them in oven 250 degrees for 30 min per the recipe. Then I reduce temp to 400 degrees (I don’t do 425 degrees) for 40 min only. When i take them out, I add more Desser Heat to that half of the wings and shake ’em up. Then, the other half of the wings get Thai Chili Sauce poured on them (bought from Costco). And then I gets busy! They are great. Thanks for the great recipe. I should add, the best thing about this is it is SUPER EASY! Faye, Thanks so much for your feedback and for sharing how you make them. That Thai sauce sounds amazing! Note re: ALUMINUM-FREE BAKING POWDER. Be sure to check your can of baking powder to make sure it does not have aluminum in it. While prepping for this recipe, I found The Clabber Girl does have it, even though I found an article online that stated they removed it. They did, but it is not marketed as Clabber Girl, but Rumford; I found Rumford that is by the same manufacturer of CG online, but it is not available in stores near me. But here is the GOOD NEWS: You can make your own baking powder with no aluminum in it by combining 1 teaspoon baking soda and 2 teaspoons cream of tartar. Of course, you would have to figure how to make the amount needed for this recipe. I honestly just found this recipe today and have not made it, but I do have the wings and I am eager to make it this week. I just wanted to share what I learned about the baking powder. Can’t wait to try this recipe. Thanks for the tips, Marcella! OH. MY. GOSH. These are unbelievably delicious, and you have to try them! I made these today, exactly as directed in the recipe, and they are so, so good! Even without any type of sauce or doctoring up, they are fantastic. They don’t need salt or pepper, even! I planned on a sauce, bu I ate mine plain and only stopped eating them because I’m watching my weight. They are so tempting to keep eating, though! Thanks for such a great recipe! Ha! Marcella! Thank you so much for your comment. That is exactly how I feel about these wings too! Buffy, That’s such a fantastic compliment. Thank you so much for trying them and for letting us know how much you liked them! These come out so crispy! Have only made wings a few times but these by far are the best. Got some in the oven now. I was really impressed! Hey all! I did a batch of wings tonight and have to say, they came out pretty good. I only say pretty good because I amk and have eternally been, a diehard deep fryer guy when it comes to wings registering 20 years plus with using peanut or veggie oil. Because it was a rainy Sunday here in PA, I opted to try the oven. So hear is the real deal folks. Using this recipe is a winner. 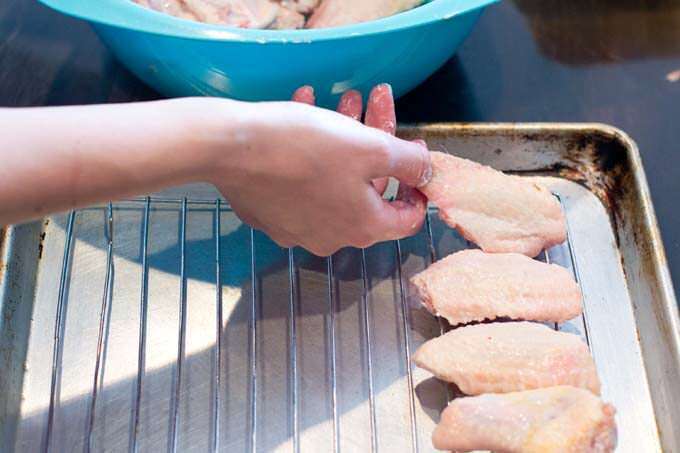 BUT, YOU MUST FLIP THESE WINGS halfway through the baking process in order to get a full crisp all around when using a baking rack over a cookie sheet pan layered with aluminum foil (and a layer of salt if you wish to absorb moisture). This comment was brought out earlier by another person so I am here to reinforce the point. I did my wings as directed at 250 for 30 minutes followed by 50 minutes at 425 and actually thought they could go 60 minutes; however, I am the kind of guy that likes my wings very/very crispy. With that, my wife loved these wings because they were not like the deep fried version I usually do. In a way, they had the shake and bake version but MUCH better since they were smaller. Please know, I hate shake and bake chicken because chicken legs and thighs just do not get as crispy as this recipe. So, what does this mean? Flip’em folks! I will be sure to give this recipe another try next time when it is raining and give it a B+ but only because I am a deep fryer guy. The A+ though comes in with the hot wing sauce. I gotta tell you, I like this recipe as it has a very nice flavor and does not have an overwhelming heat to it allowing you to eat with ease. Hey John, Thanks for the comments and feedback. Glad you loved the sauce too! Is it ok to add baking powder to chicken? I mean is it healthy or are there things we should know about ingesting baking powder? These wings are the best! Thanks Saige! I love them too!!! Wow, this has to be the worst meal I have ever cooked! The taste of baking powder and the way it dries out your mouth is awful. I don’t necessarily find baking powder bitter, but definitely not something I want as a principal ingredient. I was hoping that a sauce might have disguised the taste and mouth feel, but hours later it still hasn’t gone away. My husband who will eat pretty much any experiment I put in front of him couldn’t even eat these wings and I followed the recipe down to the letter. We spent the evening apologizing to each other, me for presenting him with such an inedible meal and him for not being able to eat it. At least we had lots of veggies to fill up on. So much for the science! I’m not sure what to say. Lots and lots of people have tried this recipe and loved it, as you can see in the comments. When I make it, and I make it often, I can’t taste the baking powder at all. There’s only 1 tablespoon of it for 20 wing pieces. I have no idea what went wrong for you but you shouldn’t have been able to taste it. 1 tablespoon (15 milliliters) of baking powder (not baking soda), and ideally an aluminum-free baking powder, for 10 wings, each cut into two pieces yielding 20 pieces. Some of the driest tasting chicken Ive ever had in my life. I just came here to say that I made these (for the second time b/c they were phenomenal the first time!) tonight with baking SODA… Ugh, fail. Krisin, Oh no! I’m so sorry that happened! They’re dreadful with baking soda, I know. So glad I picked your post! Thanks, these were terrific! Not sure how some people could hate this recipe. I doubled the recipe, cus I had about 40 wings, and it came out amazing. Crispy outside, tender juicy inside. I tossed half in buffalo sauce and half in bbq, they went very quick. Thanks for the great recipe. You’re welcome, Alex. So happy you liked it. Thanks for letting me know! Hi I am making these tomorrow for a tailgate at the stadium. Can I heat up the sauce at the stadium and add it to the wings to heat them up. Darn! Have these in the oven now and just reading all the comments… I went just by the steps in the beginning of the article and all is says is baking powder, mine has aluminum in it 🙁 have a feeling they might not taste so great. Becky, I’m curious how they turned out. There was already a discussion at the top of the article about using aluminum-free baking powder, and it said that in the recipe itself at the bottom. However, I have also added it to step #1 so that others won’t make that mistake. I’m so sorry. However, I hope they turned out ok for you. The aluminum taste only seems to be noticeable to a small minority of people. I made this recipe with regular baking powder for ages before finding out that some people tasted that. Fingers crossed! Amazingly good! Skin was crispy and the meat fell off the bone like a pork rib. I pretty much followed the recipe but added some cayenne pepper, garlic salt instead of plain salt and cajun spices to the baking powder and tossed in a maple chipotle BBQ sauce to finish. I like more heat so next batch will be mango habanero. That sounds delicious, Rick. So happy you liked them! Michele, You would need to finish them at your friends. I think you could just do the last half an hour there and it should work. These were unbelievably delicious and crispy. The only change I made was I added Splenda to the sauce so it had a sweeter taste. My husband was totally blown away and is miserably full right now! Now, I am wondering if I should change the times if using my air fryer oven. It does cook a little bit faster. Any thoughts on that? Thanks! 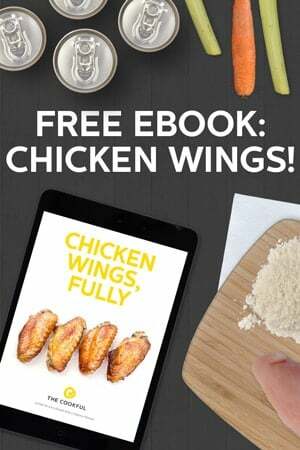 Angela, We just posted an air fryer chicken wings recipe on the site here https://thecookful.com/air-fryer-crispy-chicken-wings/ but it doesn’t use the baking powder method. I should totally test that out. My best guess would be that the lower temperature part of the cooking would be the same, or close, and then that the high heat cooking would be less long. I’m so confused. I was excited to try this out for the Colts playoff game. I thawed the chicken wings, patted them dry, added the baking powder and salt, cooked them on a rack like I always do, on the temps and times written above, and they came out LESS crispy than the way I normally bake them. Normally I arrange the frozen wings on a rack, bake at 500 degrees for 35 minutes, flip all the wings, then cook another 30 minutes. I do not drain the liquid as I believe it helps keep the chicken moist. They come out crispy and no prep work—straight from frozen to oven. So I’m not understanding what this recipe does for all the work involved. And why I’m not getting the expected results. I don’t know what happened. These turn out really crispy usually. And we did a taste test between using the baking powder and not using it and there was a definite difference https://thecookful.com/par-cooking-wings-comparison-lyndsay/ I’m interested to try your method though. 500F for an hour, straight from frozen? And these are plain wings, correct? They haven’t been pre-sauced or pre-fried or anything like that? An hour at 500F would certainly make them very crisp though. I get that. Want to let you know I really loves your recipe for chicken wings. I use Costco’s Kirkland organic chicken party wing. It has the 1st and 2nd sections and ready to bake. I also use the Power Air Fryer Oven because it comes with a rotisserie basket that fits 2 packages of the Costco wings that’s about almost 4 lbs. I follow your instructions but cook it at 400 degree on the AirFryer oven for 40 minutes then check the temperature and normally have to cook it for another 20 minutes total 60 minutes. It comes out very crispy. About to make it again 4th time in a few minutes for tonight’s dinner. Richard, That’s fantastic. Thanks for the info about the air fryer ofen. I have an air fryer but it doesn’t fit that much in it so I tend to stick with my regular oven for this. But I bet others will love knowing that they can do this! I made these before in the oven and they came out great. So now I’ve bought a nifty air frying toaster oven. What would you recommend I cook these on in the air fry oven? Same times/temps? Katie, I haven’t tried these in the air fryer yet. There is a post on our site for crispy air fryer wings that doesn’t use the baking powder process though. I Think it’s because the air fryer gets them crispy without needing that. Here it is https://thecookful.com/air-fryer-crispy-chicken-wings/ If you want to do the baking powder method though, yes, i would guess that the same temps and times will work. I wonder if they will cook and brown more quickly though. I’d watch them carefully. Totally awesome. Best I have ever made. Just wish there was a Face Book button to share. There is a facebook button at the top of the post and right under the recipe. Thanks! Absolutely fantastic! So crunchy. The best homemade chicken wings ever! Just in time for the Super Bowl. My husband even likes them and he is picky about his wings! Thank you sooooo much. Fantastic! Thanks for letting us know, Lisa! Sorry but have to say these were not as crunchy, crispy as everyone is saying. Followed the recipe exactly and the skin was chewy – not crisp. Also, very pale skin. I will try this again but will first dry my wings, coat with olive oil and then use the baking powder. I did like the sauce although I did not use as much hot sauce. The lemon garlic flavor was fantastic. Thanks for sharing! Mary, I’m not sure what happened for yours. You might want to try getting an oven thermometer to make sure that your oven is at the correct temperature. Sometimes ovens are off. I have two ovens and have a thermometer in each one because they are not the same. The skin should have definitely been brown. Even the taste test we did with some wings that had the baking powder versus wings that did not, resulted in browning. You can see that here https://thecookful.com/par-cooking-wings-comparison-lyndsay/ . Sorry this didn’t work out for you. It seems that this whole confusion started because certain manufacturers have labeled their product as “aluminum-free baking soda.” That would lead one to believe that there IS indeed varieties of baking soda that do contain aluminum, however, that is not the case. 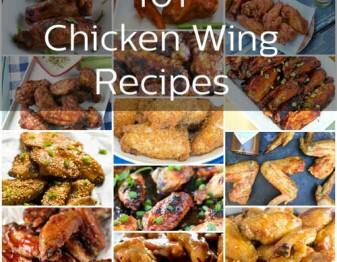 Love all photos you posted, Chicken wings is my favorite, so I’ll try your recipe this weekend and see how it works, hope it’ll as good as you do and my kids love it :)). Five stars for you and thanks for sharing Christine! Fred, did you mean baking powder instead of baking soda? My experience with baking soda is that the flavor is bad and very strong. The term is ‘Dry-Brining”. Very easy & great results – chicken or turkey, whole or piece, grill or baked/ whatever. I don’t wet-brine (too messy). But… THE KEY is in resting! This means letting it rest in the fridge uncovered anywhere from 6-24 hrs (2-4 hrs for wings). It gives more flavor, crispy crackly skin, and moist meat. The perfect ratio in 3 easy steps! 1 part Baking Powder to 3 parts Kosher Salt is common…. First, place on pan and pat the poultry/skin dry w/ paper towels to remove moisture (moisture is the mortal enemy of crispiness!). Second, sprinkle the BP/Salt/Pepper mixture liberally; this is absorbed (not rinsed off). Third, place in fridge to rest. When arranging for oven placement they should have separation between each piece. Do not overcrowd. Bon Appetite!! * Note: While baking SODA does produce a similar texture, it also adds an unpleasant metallic flavor to the skin, I wouldn’t advise substituting one for the other. You can however make your own BP: 1 part Baking Soda to 2 parts Cream of Tartar. A ‘DIY’ Homemade Baking Powder also provides an easy NON-aluminum version/taste. *Cream of Tartar has amazing benefits, especially against stress. We take it every morning: Lemon or Lime juice fresh or concentrate w/ 1/4 teaspoon of Cream or Tartar and a tiny pinch of Himalayan Pink Salt. Mix dissolve and top up w/ about 6 oz fresh water. Cream of Tartar is exceptionally rich in potassium, and that is going to react with the vitamin C in the juice, which is going to lower cortisol levels. This Stress Cocktail is also excellent if you have trouble sleeping or retaining water. Many proven benefits. Good food, Good Health! Oops. I’ve been mixing up the 2 all day but yes I used powder. Made the recipe 3 times now and perfection every time. Thanks!